Whew, this week, is almost as busy as last week. But, I'm grateful for the work, and the paper craft requests. 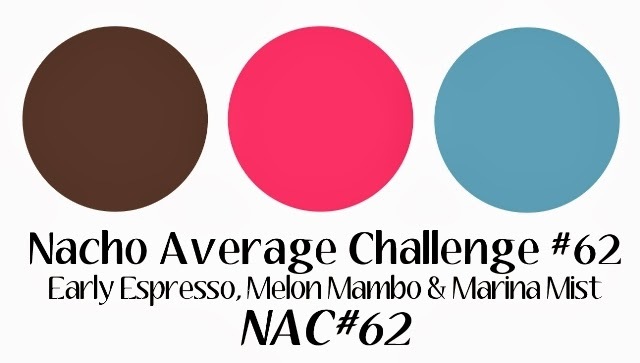 But, before I go back into my craft room, I played along with the lovely ladies over @ Nacho Average Challenge. They have a color challenge this week, and I struggle with those. So, I kept my card 'clean and simple' (CAS). I used Marina Mist as my main color. Then added splashes of Melon Mambo and Early Espresso. The card base is marina mist. I added a panel of marina mist dsp. 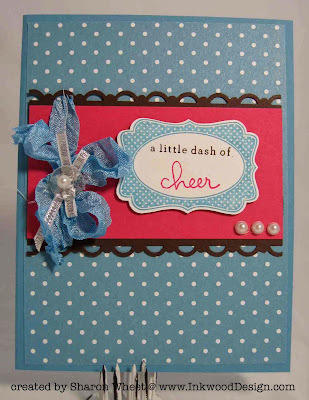 I used my scallop trim border punch to create the decorative border out of early espresso card stock. I added a strip of plain melon mambo card stock across the front of the card. I hand dyed some very vanilla seam binding with my marina mist re inker. To add a little pizzazz, I tied a vintage faucet button onto the seam binding bow with some thin silver ribbon. I created my sentiment label with the four frames in marina mist classic ink. I stamp the sentiment in both early espresso and melon mambo classic inks. I adhered the frame onto the card front with dimensionals. But, I felt the card was missing a little something, so I added a trio of half pearls along the right lower edge of the melon mambo card stock strip. I hope you have been inspired to play along with us @ NAC. We would love to see what you create. Now, I need to get back to some chores and crafts. I'll post a photo of these sweet little gift tags I have made for my 'exclusive' gift for folks who received my holiday craft fair schedule. Take care, and take some time out of your busy schedule to create something beautiful!